Fed up with numerous accounting scandals that rocked the country in the mid-2000s, the U.S. enacted new laws that enhanced financial disclosure standards for public companies. Sarbanes-Oxley requires that publicly traded companies provide complete transparency into a company’s data and the underlying IT environment to make sure that the data is protected and secured. Unfortunately, the problem is that companies might have tens of thousands of end points that don’t have this level of visibility into their networks. It’s far too complex. 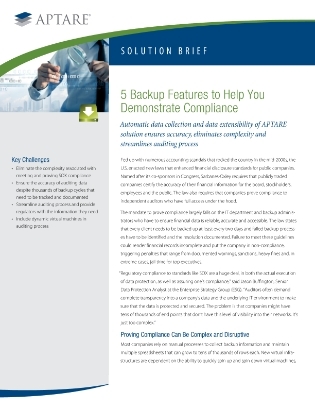 In this brief resource, you will discover how a storage backup manager eliminates the complexity and manual labor associated with SOX auditing by automatically collecting backup data in real time and storing it in a central web-based repository where administrators and auditors can access, analyze and record the information.